A national impulse to establish grammar schools for young children and academies for those considering college characterized educational efforts in the years following the American Revolution. 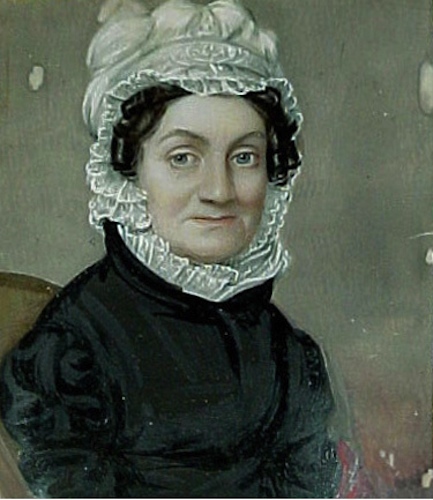 While several academies existed for girls, few proved more influential than Sarah Pierce’s Litchfield Female Academy. Pierce was born in Litchfield in 1767. She never married and instead dedicated her life to educating young women. 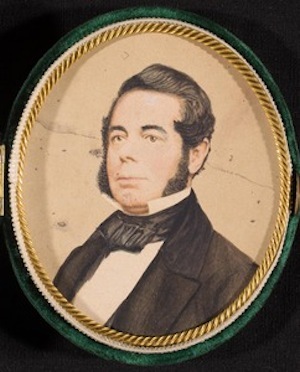 Pierce’s father died when Sarah was 16, and her brother, John Pierce Jr., invested in an education for his sister to encourage her to become a teacher and support herself. Pierce taught her first classes in the dining room of her home. 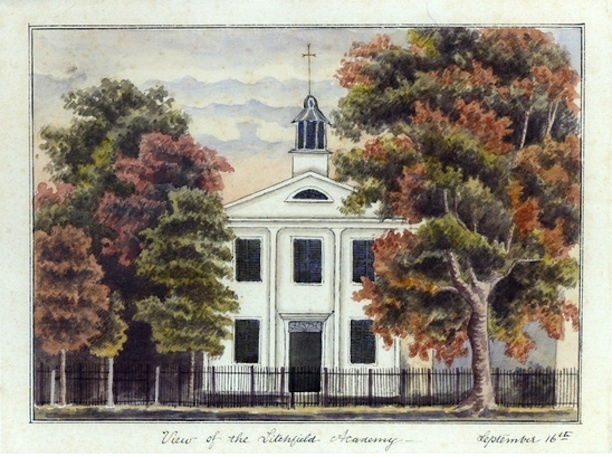 By 1798, the school Pierce began went by the name of the “Female Academy” and Pierce began a subscription list to fund the construction of a new school building, which by 1803, sat at a site on North Street indicated today by a stone marker. Here Pierce introduced young women to her revolutionary ideas about education—namely, that girls should be taught the same subjects as boys. These subjects included such intellectual staples as geography and history. Pierce even went so far as to write her own histories when she could not find suitable texts. You are expected to rise early, be dressed early, be dressed neatly, and to exercise before breakfast. You are to retire to rest when the family in which you reside request you. You must consider it a breach of politeness to be requested a second time to rise in the morning or retire of an evening. Mr. Brace had all his bugs to school this P.M. He has a great variety, two were from China, which were very handsome, all the rest were of Litchfield descent, and he can trace their pedigree as far back as when Noah entered the ark. Pierce’s students boarded with Litchfield families. The town contained several large boarding houses (including Aunt Bull’s on Prospect Street) many of which took in students from the Female Academy and the Litchfield Law School. Over 3,000 young women—and about 120 young men—received instruction at Pierce’s school before it closed in 1833. Their intellectual, social, and artistic abilities helped make Litchfield one of early 19th-century America’s most cosmopolitan towns. 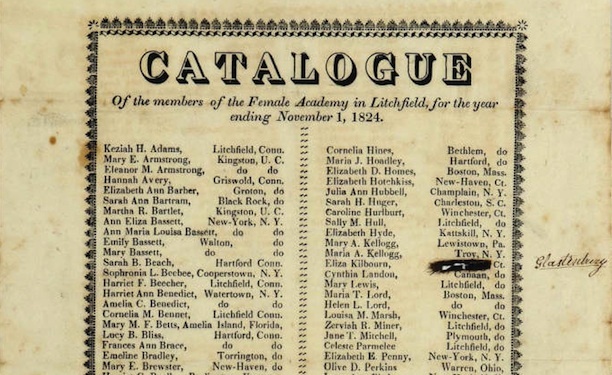 “Catalog Record of the Litchfield Female Academy Collection, 1787-1927.” Litchfield Historical Society, 2014. Link. “Litchfield Ledger - Database.” Litchfield Historical Society, 2016. Link.